The Eyles & King families were generally associated with the two properties in St Mary Street near the corner with Horseshoe Lane during a large part of the 1900s. It was here that they ran their business specialising in sale and repair of bicycles, but also offered motor bike and car servicing. In the 1960’s I was much amused that I was able to take my car to a bicycle shop to have it MOT’d. The business was started by William Eyles in what became known later as 23 St Mary Street and the Eyles family lived in the house above the shop. As the family grew, and combined with the King family, they also acquired the house next door which later became known as Llanfoist 21 St Mary Street and for many years the Kings occupied both houses. William and Minnie Eyles – William was born in Woodford in Gloucestershire, the son of Charles Eyles, a carpenter and his wife Elizabeth. He was born on 16th October 1869 and baptised at Berkeley on 30th July 1870. He appears to have the full name of ‘John William’ and it is interesting to see that all the records refer to him as ‘William’ except the records of the Council school which show him as John Eyles. In December 1898, William married Minnie Timbrel in the Malmesbury area. Minnie was born in Minety near Malmesbury on 10th October 1873, the daughter of John Timbrel, a butcher and his wife, Ann. It appears they moved to Thornbury shortly after their wedding. On 22nd June 1899 they baptised their daughter, Hilda Kate, who was born on 15th May 1899. The baptism took place at Thornbury Methodist Church and their address was given as Crossways. The 1901 census shows William and Minnie were living in Gillingstool with their daughter, Hilda aged 1. William was working as a blacksmith. He was also listed in the 1904 trade directory as a blacksmith in Gillingstool. On 9th April 1904, their second daughter, Gertrude Monica was born and she was baptised on 5th June 1904. On 20th January 1906 William purchased a cottage in Gillingstool and then on 18th October 1907 he bought some adjoining land there. Later documents refer to this property as ‘The Bungalow’ so we assume that William had a new place built on the site of the old cottage. By 1914 he was listed as a cycle agent, still at Gillingstool. Both Hilda and Gertrude started at the Council School and went on to the Grammar School. Within two years of joining the Grammar School, Hilda left to become a pupil teacher at the Council School. She was just 16. On 14th December 1916 William purchased 21 St Mary Street, together with the yard and outbuildings at the rear with an access onto Horseshoe Lane. The indenture describes William as a machinist. We know from a newspaper article in September 1923 that Minnie bought the premises in St Mary Street (assumed to be both 21 and 23) in July 1922. On 24th June 1930 William purchased a cottage in Gillingstool (which is still standing on the corner of Oakleaze Road and Grovesend Road). He paid £150 for the property. It is interesting to note that the sales notice for the property mentions a well there. The 1931 and 1935 electoral registers show that William, Minnie and Gertrude are living in Gillingstool. We are not sure why they moved away from St Mary Street, but William and Minnie had returned by 1938 and they were still there in 1946. The photograph on the left shows William stood outside the shop in St Mary Street. William continued trading as a cycle agent in St Mary Street and Horseshoe Lane. It is interesting to see that the trade directories from 1923 until 1936 list the business under the name of ‘William Eyles & Son’. We haven’t found any record of a son. We do know that his son-in-law, Charles Adam King, the husband of William’s daughter became involved in the business and that it became known as ‘Eyles and King’. See below for more details of Charles and Hilda King. We think the photograph below shows Hilda stood outside the shop (note the casement windows in the photo above had been replaced by sliding sash windows). On 14th June 1945 William Eyles sold 21 St Mary Street to his daughter, Hilda, the wife of Charles King for £400. The Western Daily Press of 6th August 1945 reported on a serious fire at the garage when a number of cycles and motorcycles were damaged. The blaze took the Bristol N.F.S an hour to control but two cars and a quantity of equipment were rescued. William Eyles died on 2nd June 1947 aged 77 “after much suffering.” His funeral was held at St Mary’s Church. In his will he left his property to his wife, Minnie. This included The Bungalow at Gillingstool, the cottage at Gillingstool and a garage in Horseshoe Lane. Minnie was still living in St Mary Street in the 1950 electoral register, but by 1954 she had moved back to live in Gillingstool . Presumably she was living in The Bungalow as her other property was being to tenants. On 20th June 1958 Minnie sold The Bungalow at Gillingstool to Grantley and Eileen Parsons. In 1963 when she gave 23 St Mary Street to Hilda, Minnie was living at 2 Pullins Green and she was still living in the 1965 electoral register. On 22nd January 1975 Minnie sold the cottage at Gillingstool to her grandson, Norman Colin King for £4,500. At the time Minnie was living with her daughter, Hilda, at Big Oak Station Approach, Minety, Malmesbury. Minnie lived to be 101 before dying on 9th November 1975. William and Minnie’s daughter, Gertrude Minnie married Frank Hendy. They settled to live in Gloucester Road, Rudgeway. Gertrude died on 22nd August 1955 aged 51. Charles and Hilda King – Charles Adam King was born on 27th December 1897. Charles was the son of William King and Mary Ann Eyles who had married in 1893. The 1901 census shows the King family were living at No. 2 Mrs Wetmore’s Cottages, Ham & Stone. William was a coachman and he and Mary had three children: Frank James aged 7, Elton Vivian aged 5 and Charles Adam aged 3. Charles was still living with his parents in Stone in the 1911 census. He had become a general labourer. Charles married his first cousin, Hilda Kate Eyles, (who was the daughter of William and Minnie Eyles (see above) in the Guildford area in 1920. Their son, Norman Colin, was baptised in Thornbury on 9th April. At that time, Charles was already employed as a cycle repairer, presumably by his father-in-law, William Eyles. Charles and Hilda were living at Gillingstool at this time and they were still there on 8th August 1923 when their daughter, Mildred Joan, was baptised. As time went on, Charles became a motor mechanic as well as a cycle agent and repairer. He was described as a motor mechanic in 1943 when his daughter, Mildred, married Ernest Williams, a sergeant in the 353 Coast Artillery. Mildrd and Ernest moved to live in Happisburgh, Norfolk. The photo on the right shows Charlie in front of his shop in 1964. Charles and Hilda had another son, John Charles Edward King, who was born in the Epsom area on 16th October 1920. In the 1939 register compiled in preparation for the war John was living at home with his parents. He was described as a motor engineer. Both John and Norman worked for Parnalls in Yate and were employed there when it was severely damaged in an air-raid in the early part of the War. In November 1944 John joined the Army and was sent to Egypt in May 1946. Norman joined the RAF in August 1945 and was sent to Palestine until John applied for Norman to be stationed with him and he was transferred to Egypt. In the 1950 electoral register John and Margaret Joyce King were listed as living in St Mary Street. There is a baptism record dated 2nd October 1949 for Edward Charles King who was born on 1st August 1949. His parents were John C. E. King, a cycle agent and his wife, Margaret. Their address was shown as St Mary Street and the godparents were Richard King, Frederick King and Phyllis King. Another son, Stephen John was born on 1st May 1951 and John and Margaret were still in St Mary Street. Norman (known locally as ‘Nimmy’) settled in 21 St Mary Street which about 1950 acquired the name of ‘Llanfoist’. Nimmy’s wife was Gwendoline E. Green from Old Down. Although the business was owned by Hilda King, Norman was shown as the proprietor in an advertisement for Eyles and King in the Flower Show programme for 1958. On 23rd September 1963, Nimmy bought 21 St Mary Street from his mother for £3,800. He sold the property to Northavon District Council by a conveyance of 21st March 1978 for £17,000. 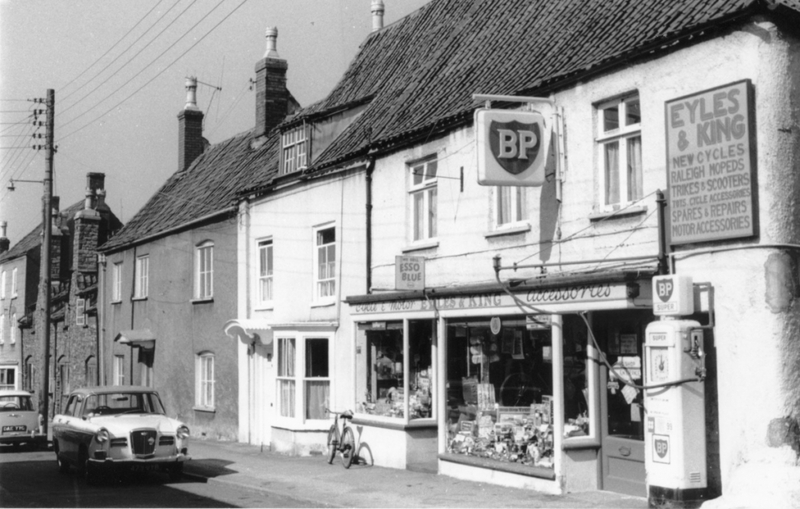 Hilda sold 23 St Mary Street to Thornbury Rural District Council for £8000 on 4th April 1973. At the time Hilda was living at Big Oak Station Approach, Minety, Malmesbury. Charles died on 13th February 1984 aged 87. Hilda died on 13th April 1988 aged 88. Nimmy moved to live in Blakes Avenue and he died there in 2009.